Coral reefs are threatened by human activities throughout the world. In southeast Asia, the hot spot of coral diversity, more than 80% of the reefs are at risk from coastal development and harmful fishing practices. Population growth and development threaten the survival of coral reefs. Population growth and urban development currently rank among the greatest threats to coral reefs. Development activities cause erosion, resulting in the run-off of sediments which eventually reaching the reefs. Also stormwater runoff carries fertilizers and sewage into the ocean, damaging coral reefs. 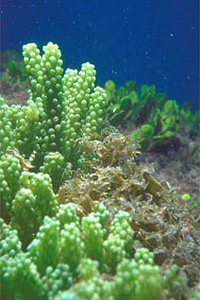 Increase of nutrient concentrations within the reef environment is followed by increase of algae, which may smother corals. Whether it is from direct sedimentation or an increase in turbidity from nutrient-loading, the amount of sunlight reaching the corals is reduced. 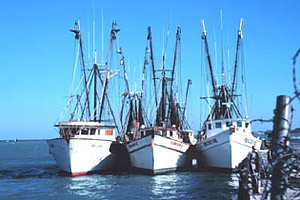 Overfishing has altered ecological dynamics of marine communities. 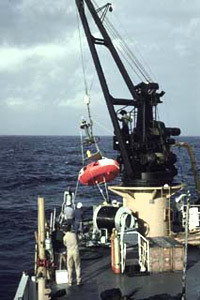 Along with human population growth, the harvest of resources from the sea is ever-increasing. Overfishing has changed the ecological dynamics of marine communities, allowing some organisms to dominate reefs that once were kept in check by large reef fish populations. Fishing practices have also become more destructive as fish populations decrease. In some regions, indiscriminate fish traps are used while in other areas the use of dynamite and cyanide have become common practice. 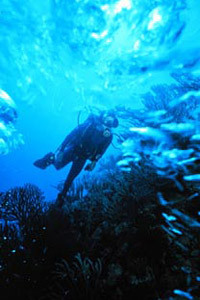 Increase in tourism is responsible for increase in reef damage. Coral reefs attract ecotourists, bringing much needed currency to tropical regions. Ironically, the increase in ecotourism is usually accompanied by an increase in reef damage. Divers and snorkelers may harm the corals by touching the polyps, while the boats transporting ecotourists to the reef may damage the reef by dragging anchors. Although ecotourism is responsible for reef damage, if it is carefully managed and monitored, ecotourism may actually help preserve these valuable habitats. Fish and invertebrates are harvested from the world’s coral reefs. Many species of fish and invertebrates are harvested from the world’s coral reefs for the aquarium industry. Unfortunately, poisons such as cyanide are often used in the Indo-Pacific region, causing the deaths of many fish and surrounding corals. After the live fish are collected, up to half die as a result of poisoning or stress. Those that do survive have high mortality rates in home aquaria due to dietary and physical requirements. 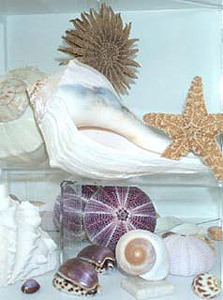 Corals and shells are also collected throughout the world and sold as souvenirs to tourists, made into jewelry, or exported as curios. Rising sea temperatures cause coral bleaching. Global climate change may cause increases in sea temperature and sea level as well as ocean current patterns, all of which can cause damage to reefs. Corals are very sensitive to water temperature changes, with rises in temperature resulting in coral bleaching episodes. Storms and hurricanes may cause extensive damage to reef structures and communities. Although much of coral reef destruction is blamed on human activity, natural disturbances are also capable of causing extensive damage to coral reefs. 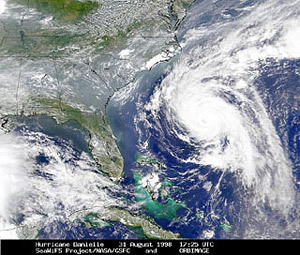 Strong waves caused by storms and hurricanes may smash into the reef, breaking up large corals and creating rubble fields. Storms also harm reefs indirectly by disrupting nearshore habitats, resulting in the release of large amounts of sediments and freshwater to come into contact with the reef. These disturbances open spaces for new organisms to colonize, preserving overall biodiversity. Heat-related stress often occurs during late summer months when the sun is intense. Corals can survive water temperatures as high as 86-95°F (30-35°C), depending upon the species. 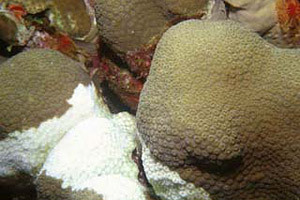 Increases in water temperature often causes loss of symbiotic algae from coral tissues, referred to as coral bleaching. Corals are also susceptible to cold stress at temperatures at or below 57°F (14°C). 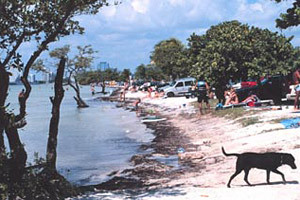 Cold water masses originate in Florida Bay, causing coral death in patch reefs long the water current’s path. However, most offshore corals experience little damage due to the mixing of the cold water current with the warm offshore waters, moderating temperatures and lessening the impact on surrounding reefs. 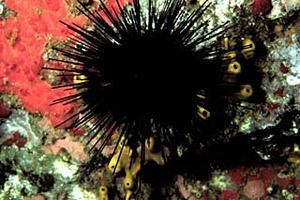 Coral reef organisms, such as the long-spined sea urchin, are susceptible to many pathogens. Along with coral bleaching, black band disease, and white band disease, coral reef organisms are subject to many pathogens. During the 1980s, a water-borne pathogen caused the massive die off of the long-spined sea urchin, Diadema antillarum. Long-spined sea urchin populations were reduced as much as 95% in some locations. This urchin is an important herbivore, keeping algae growth in control in reef habitats. The decline in sea urchin populations resulted in algal overgrowth throughout the reefs of the Caribbean. erosion: the wearing away of soil, rock, and sediments, etc. by the action of wind, rain, and other weather-related elements. turbidity: measurement of water clarity, turbidity increases when more light is scattered by particles suspended in the water. dynamite: an explosive that is made of nitroglycerin absorbed in a porous material and that often contains ammonium nitrate or cellulose nitrate, used in preparation for construction or in water to kill fish which are then quickly collected. cyanide: a group of poisonous salts used to capture fish. biodiversity: in an ecosystem, variability among living organisms from all sources, sometimes measured by the total number of species or other taxonomic groupings, and their relative abundances. pathogen: any agent, most commonly a microorganism, capable of causing disease. herbivore: an animal that feeds on plants.